The Neponset River was once a severely polluted industrial river. 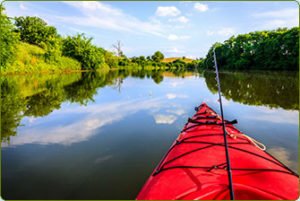 Today, most streams in the Neponset River system meet swimmable standards during dry weather and most of the river has been opened up for canoeing, bike paths and waterfront parks. Join Ian Cooke, Director of the Neponset River Watershed Association, for a program to learn about triumphs and challenges ahead for this 120 square mile area that is home to 330,000+ people and a drinking water source for 120,000 people. The Watershed includes parts of 14 cities and towns: Boston (Hyde Park, Mattapan, Dorchester), Canton, Dedham, Dover, Foxborough, Medfield, Milton, Norwood, Quincy, Randolph, Sharon, Stoughton, Walpole, and Westwood. As Executive Director, Ian has developed and expanded the organization’s programs and fostered development of the watershed approach in MA. He has served as Executive Director since 1993. Ian currently serves as Board President for the MA Rivers Alliance and was formerly a Board Member of the MA Watershed Coalition. He has a BA in Environmental Conservation from the University of New Hampshire.